This stunning space wallpaper shows a striking pair of wildly misaligned planet-forming gas discs around both the young stars in the binary system HK Tauri. This stunning space wallpaper shows a striking pair of wildly misaligned planet-forming gas discs around both the young stars in the binary system HK Tauri. 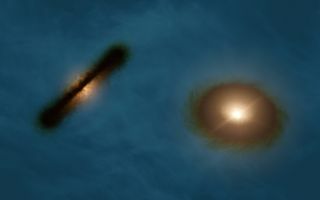 ALMA observations of this system have provided the clearest picture ever of protoplanetary discs in a double star. The new result demonstrates one possible way to explain why so many exoplanets — unlike the planets in the Solar System — came to have strange, eccentric or inclined orbits.